The new Android 1.5 Early Look SDK is out since a few weeks. The "Android 1.5 highlights" page does not mention one highlight, which IMHO will become very important for all developers on the Android platform because it allows you to find memory leaks easily and analyze the memory usage of your Android applications. I'm talking about the hprof-conv tool that allows you to convert an Android/Dalvik heap dump into an .hprof heap dump. The tool does not preserve all the information, because Dalvik has some unique features such as cross-process data sharing, that are not available in a "standard" JVM. Still the .hprof file is a good starting point and can be read with the Eclipse Memory Analyzer, which will interpret it like a normal file from a Sun 32 bit JVM. In the future it should also be not that difficult to read the Dalvik heap dump format directly and provide more information for memory analysis, such as which objects are shared and also maybe how much memory is used by native Objects (haven't checked that). I therefore created the heap dump using the emulator. Heap dumps are actually created by sending the process a SIGUSR1 (-10) signal. Now you can use the Eclipse Memory analyzer to analyze the memory usage of your application. or finding "String duplicates" in Eclipse (my favourite memory analysis trick). You might also take the time and check all my memory related posts. Now I would like to present you a new typical memory usage issue that I just found when playing around with the new Android cupcake 1.5 prerelease. I did a heap dump of the android gmail application and loaded it into the Eclipse Memory Analyzer. The high number of Rect (Rectangle) objects looked suspicious to me. Also they retain not that much memory, I thought it would be interesting why such a high number of Rect instances was alive. When checking the Rect objects I immediately saw that most of them seemed to be empty e.g. bottom=0 and left=0 and right=0 and top=0. It seemed to me that this was the time to again use the most advanced feature in MAT. 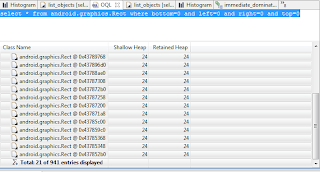 I'm talking about the OQL view, which allows you to execute SQL like queries against the objects in your heap dump. I very rarely used this feature in the past because the standard queries are good enough almost all times and because writing your own command in Java is not that difficult. Still here it would help me to find how many of the Rect instances where empty. Which showed me that out of 1320 Rect instances 941 where "empty", which means that over 70% of the instances where "useless". classes which are subclasses of android.graphics.drawable.Drawable. Also this issue might not increase the memory usage of gmail that much it's still a fundamental/systematic problem, which IMHO should be fixed. Even if we would tolerate the memory overhead, we are still left with the problem that the number of objects the garbage collector has to trace during Full GC is higher than needed, which at least potentially can lead to sluggish UI. It's also a kind of fundamental problem because all subclasses of Drawable inherit the problem. So instead of always using the default constructor it would most likely better to use lazy initalization and only initialize the field when it's first needed. A copy on write strategy could also be used by sharing an "empty" Rect instance in the beginning, which would be replaced by a new one as soon as the field is written ( haven't checked the code whether this can still be done). This is not a sign that Android is a poor platform. This is a kind of a problem that I've seen in the past more than once and I'm sure this kind of antipattern can be found in a lot of software out there. The issue has been fixed a few hours (or minutes?) after my post! To see how simple the change was! Just take the Eclipse Memory Analyzer and have a look at your application(s). In Android 2.3 (Gingerbread) a new command is available to trigger the heap dump. The kill command is not supported anymore. but the report did not show the reference object to the "bitmap" which caused the leak. Why? Is because of the Eclipse Memory Analyzer could not monitor the native memory? If your talking about the "memory leak" report, almost all reports are based on heuristics e.g. they have no application/framework knowledge. These heuristics only work as long as the leak is large. In your case the leak is probably not large. One could build a new command to detect exactly this leak, but this command would have to know exactly how this works on android. MAT my also not take the size of the bitmap into account, if this is a native object. I have a question. I follow your steps to get a heap dump from my Android application. But, why didn't I see the usage of user-defined classes in the histogram view in Eclipse Memory Analyzer? It is possible to see histogram of user-defined classes? it is showing could not kill pid -10:no such process error. The formatting of the commands was screwed up (seems to have been ok when I posted it). I changed the post slightly. You need to find the process id of your process using ps. then you use this pid in the kill command. "could not kill pid 10308: Operation not permitted". This only works if you have root permissions e.g. you need to run this command as root. Regarding Update 2, what IS the new command? The provided URL explains that 'kill' no longer works in v2.3, but does not suggest what DOES work. Even the ddms dump button tooltip reads "Dump HPROF file (not supported by this VM)". Thank you for sharing the information here. Do you have recommendations for creating heap dumps in v2.3? While ddms Dump HPROF wouldn't work for me in v2.3.1, it works now in v2.3.3. Again, thanks for the pointers. Thanks for the hint Kirk! Haven't really tried 2.3, but will do so soon. Great information to be check the memory usage of the phone. I want to become a good android developer in the future. I have a good knowledge about the Core Java. Thrilled to use MAT on android/dalvik heaps! I've been using Memory Analyzer before SAP donated it to Eclipse. Its bad that many developers use it ony for Memory leak analysis (and they prefer profilers at that). I've been evangelizing MAT to use for any kind of issues to look at the stateful objects in the heap. It'd be great to expose a dynamic scripting (such as JS in jHat). I'm writing some groovy extensions for MAT to write sophisticated scripts (free-hand groovy/java or a DSL) to analyze complex object graphs and also expose Query & *Resolver extension-points. Did you run into performance issues with scripting? Scripting might be something I will investigate more deeply in the near future. This site is really amazing and informative to me, i am impressed by this site. Hi.. I am not getting below line while doing same steps as u instructed.. I am getting not heap dump not complted their is no HROF..
Hey, I really glad to read this article. And definitely i will follow your steps for heap dumps. Thanks for the source. Thanks for sharing this informative post with us. I am very happy to read your blog. It’s been very beneficial. You are provided information very useful for android developer, and this app is really very user friendly; by the way thanks for share to all. I think about that Android Development is done entirely in Java, you are going to need a working understanding of the language and concepts. Otherwise, you will have a difficult time understanding and implementing Android concepts. Yup, Java has a lot of topics to learn. So does Android. You will need a good base in Java for the Android stuff to be meaningful.